Baltic amber is not a stone but natural resin containing succinic acid which is normally produced by human body and helps immune system and healing processes. In Poland amber spirit is well known natural remedy used by our ancestors to cure cold, flu, temperature, headaches, migraines, rheumatic aches and all kinds of other pains, asthma, thyroid, blood pressure and circulation problems just to mention few. I remember my granny Nina who had always a bottle of home made amber liqueur in her cupboard and was using it on us at any occasion. Add 25 g or more of crushed Baltic amber to 200 ml bottle of clear, unflavoured, high percentage alcohol for culinary use. I used 95% rectified spirit / spirytus from Poland. Leave for at least 4 weeks or longer. I left mine for about a year… and completely forgot about it until now. Couple of drops added to morning tea for colds, asthma and to prevent flu. Rub on chest, back and feet for colds and temperature. Rub twice a day on neck for thyroid problems. For runny nose rub around your nostrils and behind the ears. Inhale from soaked cotton wool for runny nose and asthma. Rub on sore places for all kind of rheumatic aches and other pains. Rub on forehead, behind ears and on wrists, best after evening bath for headaches and migraines. Dissolve couple of drops in water and drink before meal for blood pressure and circulation problems. Rub on the gums for tooth aches. Amber than won’t dissolve can be strained and reused. In Poland you can buy cheap crushed amber leftover from making jewellery, for instance at Cepelia. It is believed that even wearing unpolished amber necklaces can be beneficent for our health. I’m adding this recipe the Inheritance Recipes challenge that we co-host with Solange of Pebble Soup. 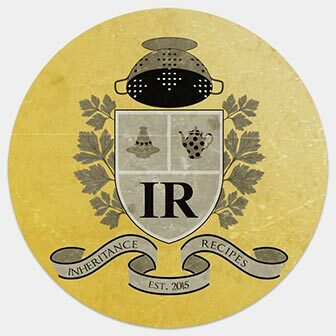 June Inheritance Recipes is hosted by Solange, please come and join us, share your inherited recipes! DISCLAIMER: Those are things I learned from my granny, neither I nor she had any medical background, so please best consult your doctor before using this remedy. Thank you Solange. It does miracles according to my granny. Therefore I’m going to add it to my tea tonight as I’m not feeling too well. I think I caught a cold or something on the plane. Where do we get the baltic amber? Hi Regina, I got mine in Poland, ages ago… In UK eBay sells raw Baltic amber.